Andrew and Rose Vanbergen have recently purchased a California inn which they are fixing up and getting ready for guests. They live in the inn along with aging Aunt Naomi, her numerous cats, and her companion, Mrs. Gummage. The Vanbergens have only one real guest so far — the mysterious Pepto-drinking Mr. Pennyman. Andrew has grand plans for the inn. Unfortunately, he’s also a bit of a slacker and he’s always managing to find excuses for doing anything but the actual work that needs to get done. While his good-natured and industrious wife is cleaning or sewing linens, he’s daydreaming about a gourmet kitchen and purchasing luxury items that aren’t really necessary. (He fancies himself an epicure). Andrew also tends to have crazy ideas that sometimes border on delusional. Sometimes he acts on these. He knows he’s being silly and that it upsets his wife, so he’s in the habit of being secretive and lying to hide his ridiculous notions and activities. This often gets him in trouble because he ends up lying to cover up his lies. Oh, what a tangled web he weaves! It doesn’t help that his new friend, Pickett, tends to see conspiracies everywhere. When Andrew and Pickett notice Mr. Pennyman’s strange behavior, they decide that Pennyman has some dastardly plan and, in their bumbling way, they start to investigate. But the truth is even stranger and scarier than Andrew suspects! Mr. Pennyman is at the inn because he’s trying to find the last of Judas Iscariot’s cursed pieces of silver and he knows the last few coins are somewhere on that California coast. If he finds them, the entire Earth is doomed! Inadvertently saving the world will require a series of hilarious misadventures involving a spoon, a carp, smuggled breakfast cereal, a pot of jambalaya, a fake advice column, prank letters, a car chase, several murders, a treasure hunt on the beach, a dangerous Chinese restaurant, and a huge cast of strangely behaving animals. I loved The Last Coin. More than anything, it reminded me of my favorite British comedy, Fawlty Towers. Andrew is Basil Fawlty, the innkeeper who’s played by John Cleese. If you’ve seen that hilarious show, you know that Mr. Fawlty, who thinks he’s more sophisticated than he really is, just can’t help but hate most of his guests. He’s also nosy, eavesdropping and sneaking around and spying on his guests. He lies to his wife about silly things so she won’t know what he’s up to. Andrew Vanbergen is exactly like that, without the British accent. Some readers will despise Andrew, and I have to admit that he’s a bit overdone in parts (especially in the middle of the book, which drags a bit), but anyone who loves Basil Fawlty is sure to enjoy The Last Coin just for the characters and humor. Add in the cool premise of Judas Iscariot’s cursed silver coins and Blaylock’s delightful prose and you’ve got an extremely entertaining story that’s bizarre, amusing, clever, exciting, and unpredictable. Christopher Ragland’s narration of Audible’s version was excellent. His voice and tone are perfect and he gets the humor exactly right. 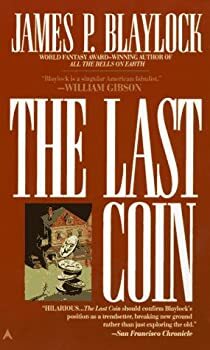 I highly recommend The Last Coin on audio. It’s one of my favorite books I’ve read this year. Note: The Last Coin is the first of Blaylock’s books about Christian holy relics, but each book stands alone. I read this a long time ago and I remember not understanding why people thought it was so funny because it depressed me. Hm. Maybe I got it mixed up with another of his books. I loved Fawlty Towers. April, this is probably the book you read. I can understand why some people wouldn’t like it. The protagonist is not likable. Of course, you wouldn’t like Basil Fawlty if you knew him in real life either. Maybe if you tried it again and consciously thought of Basil Fawlty, you’d suddenly think it was funny. I might have to give it another go.